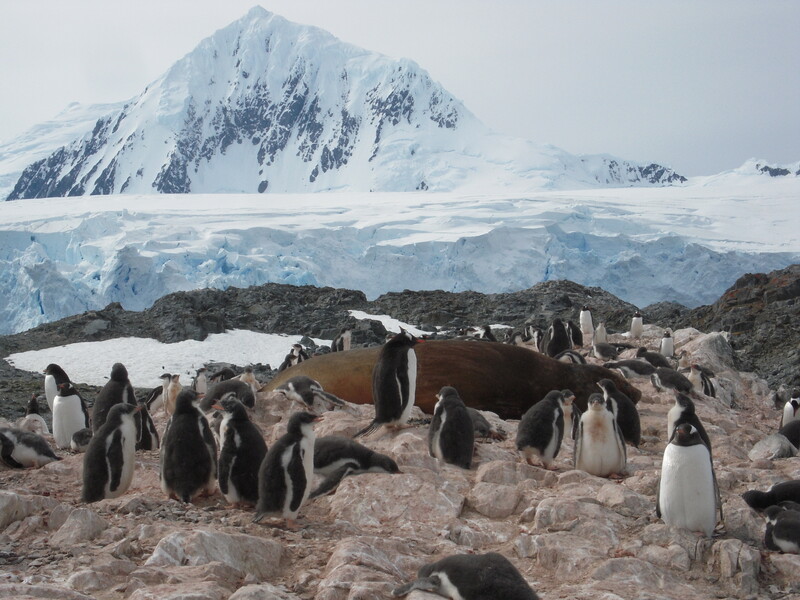 Flat Stanley joined researchers at Palmer Station in Antarctica in search of penguins and environmental data about their feeding grounds in January. This video showcases just how awesome this icon of international literacy and community can be. Armed with only a minimal amount of training, Flat Stanley managed to pilot a REMUS Autonomous Underwater Vehicle in a precision pattern through the frigid waters off the West Antarctic Peninsula — gathering vital information that will allow scientists to understand the feeding habits of Antarctic penguin species. You can see a map about the many locations this worldly traveler has gone and find out more about the Flat Stanley Project on their website. Many thanks to student travel coordinators at Sierra Canyon School in Chatsworth, CA for helping Flat Stanley make his way this far south. 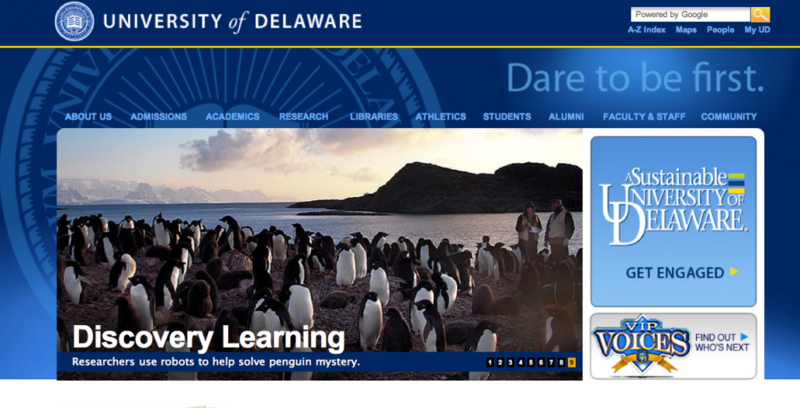 Folks seem to like penguins….so much so that we even made the front page of the University of Delaware website! Hurray! 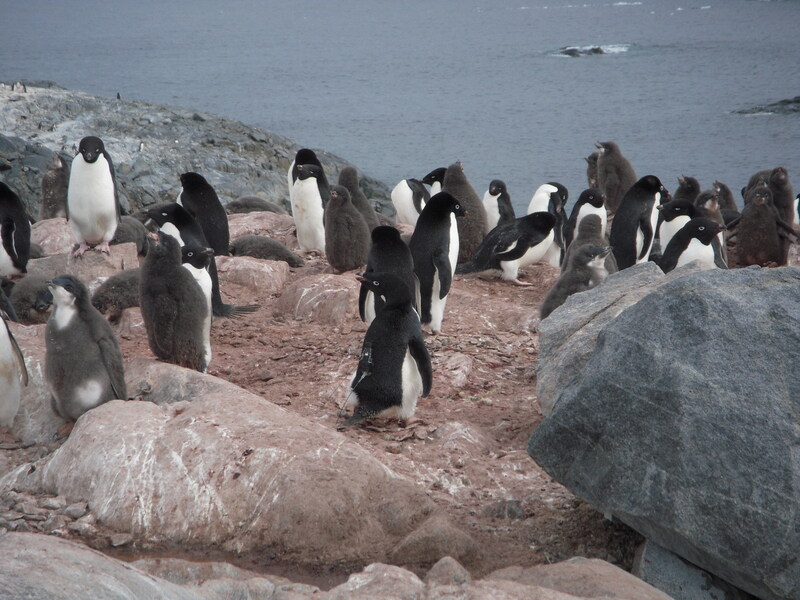 This shot is of the Adélie penguin colony on Humble Island. We had just deployed a satellite transmitter on one of the birds so we would know where to send the underwater robots (Gliders and REMUS’s). Remnants of the storm remain in the area and wind gusts are keeping the science boats at station today. Nevertheless, we did have a break in the clouds and the sun came out. The warm sun made the Gamage glacier very active and I happened to get a great video of calving. Right place, right time. 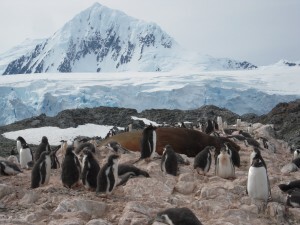 We headed out to Biscoe Point to deploy another satellite transmitter on a penguin. The plan was remove the transmitter from a Gentoo penguin which had been at Biscoe Point since mid-night. The challenge is to find the tagged bird amongst the rest! On the way, a large amount of brash ice had surrounded Biscoe Point, so we had 1-2km if slow travel through the ice. Marc Travers (our boat driver and expert birder) did an excellent job snaking in between the large chunks. Outboard motors and large chunks of brash ice don’t mix well. Hitting a large piece of ice can leave you on a boat with a busted motor. That is why we carry an extra motor in every boat. When we arrived at Biscoe Pt. we found that an Elephant Seal had climbed into one of the Gentoo Penguin nesting areas. If the penguin chicks are too young or unguarded by its parents, they can be easily crushed by these massive seals. Luckily it looked like the Gentoo chicks were old enough to avoid it. Occasionally a Gentoo adult would peck at the Elephant Seal’s thick blubber, but the giant beast didn’t seem to be bothered by it at all. 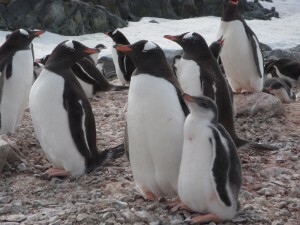 We made our way around the Gentoo colony looking for our tagged bird. She happened to be perched right on a rock preening herself where we could see her plain as day. The birders quickly removed the tag and she went back to her nest. Elephant Seals aside, the biggest threat to the chicks are Skua’s. These are aggressive scavenger birds swoop down and grab chicks right from their nests and make a meal out of them. There was plenty of evidence at Biscoe Pt. 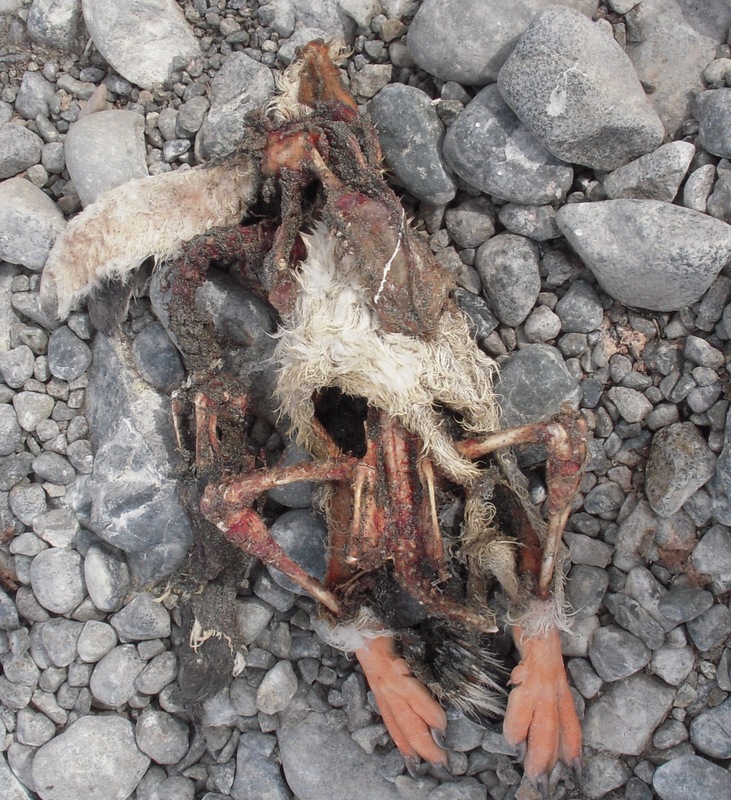 that the Skua birds had been active here. Still, even with the ever present Skua, there were plenty of Gentoo chicks that were starting to look more and more like their parents. They are are starting to get their adult feathers. Their feathers are not waterproof yet, but they will be soon. Gentoo Chick with Parent at Biscoe Pt. The next step was downloading the dive information from the tag. This data will help us understand how deep the penguins are feeding. The dive data will help us properly analyze the data coming from the underwater Gliders and REMUS vehicles. The Birders are able to download and ready the tag for its next deployment in just a few minutes with a laptop computer in the field. These are amazing little tags. Adélie Penguin packed with a satellite transmitter. transmitter. She was quickly tagged and released back to her nest. Her two grey puffy chicks are just to her right. We will be watching the satellite data closely to find out where she is eating. Then, we will send our underwater robots to sample that section of ocean. In a few days the Birders will head to Biscoe Pt. again to retrieve the tag, and thank her for her contribution to science. Our streak of excellent weather has officially come to an end with a large low pressure system in the Drake Passage. The weather was even tough tough for the ever-working “birders” who were going to deploy a few satellite tags on penguins today. REMUS missions are cancelled for the day. That might be good since one sprung a leak on a mission yesterday. Only the gliders are out….which makes gliders an awesome platform for ocean science when the weather gets a bit “snotty”. They don’t complain and don’t get sea-sick. The “Blue-Hen” continues is mission mapping the foraging locations of penguins when even the penguins are too scared to go out! 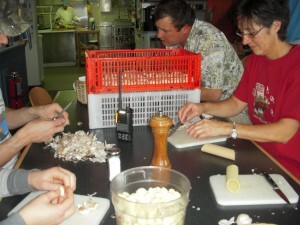 That means I get to stay home and peel garlic (very necessary for all the amazing food here). Saturday is also the day we all clean the station and have a station meeting. I got to help clean the kitchen today. That was really nice because I totally miss cleaning the kitchen at home (no, not really). We also learned that hiking on the Gamage glacier behind the station is more restricted after a new crevasse opened up. Funny story about that…..Mark Moline found it by falling into the crack. He was fine, but it was a bit un-nerving. The GSAR (Glacial Search and Rescue) team changed the boundaries after they went and uncovered the full extent of “Mark’s Crack”. 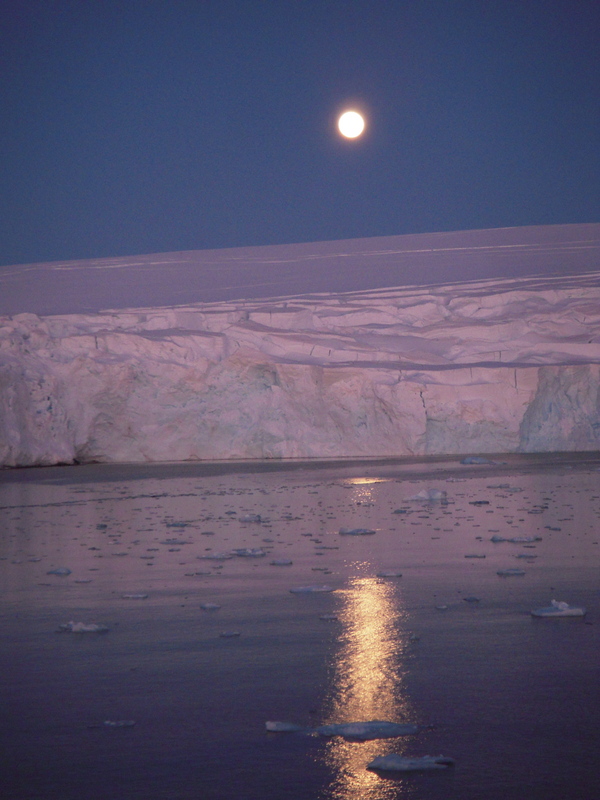 Finally, I’ll leave you with an awesome moon-rise over the Gamage Glacier. Pretty awesome sight.